This is an easy wreath to make to help set the mood for this lovely time of year. You can make it as elaborate or simple as you like. All you need is a foam/straw wreath from the craft store as your base. I had some yarn leftover from back when I knitted. (That hobby only lasted for about 20 minutes so I have lots of yarn left). Next all you need to do is wrap the yarn all the way around the wreath. When you're done with that you can embellish it with whatever you wish. Garland, leaves, corncobs, feathers, acorns, pine cones, etc. Voila! 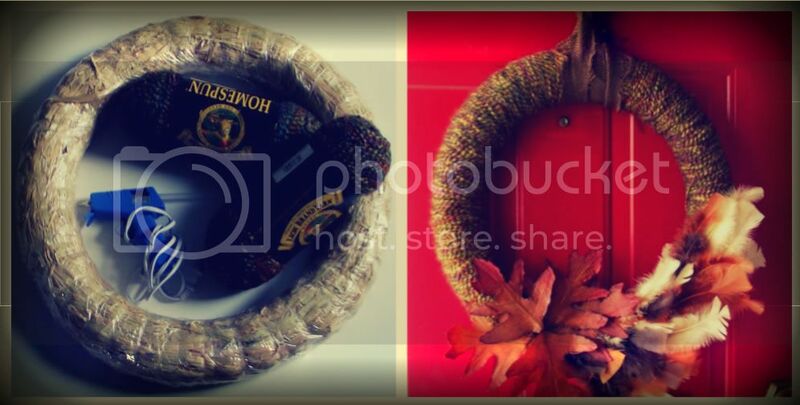 You have a new Fall wreath! Tiff I love this, did you make this one? Great idea!!! Tiff, i love this, did you make this one? that looks amazing . Thank you so much sharing and for linking up to our party Show and Share this week! Come on back this Wednesday to link up your current projects.